What is DBT? What is DBT? DBT is an innovative and unique treatment model for Borderline Personality Disorder (BPD), developed by Professor Marsha Linehan at University of Washington, Seattle. Its popularity has grown rapidly in the USA and increasingly in Europe, chiefly due to its success in effectively treating client groups whose emotional problems are particularly difficult to manage within a therapeutic relationship or an institutional setting. Treats patients with a history of chronic suicidal behaviour. Is a unique, team-based Cognitive Behavioural Therapy. Enhances the morale and effectiveness of the therapist. Can be adapted for specialties such as Eating Disorders, Adolescents and Substance Misuse amongst others. Is recognised to treat women with BPD for whom reducing recurrent self-harm is a priority (NICE, 2009). Is cited as an evidence-based intervention in A Vision for Change (Government of Ireland 2006. pp162-3). Research shows that DBT leads to improvement in various problems related to BPD, such as self-harming, suicide attempts, depression, eating problems and feelings of hopelessness. The latest National Institute of Health and Care Excellence (NICE) guidelines propose DBT as the treatment of choice for women with BPD who want to reduce self-harming. Providing a Dialectical Behaviour Therapy (DBT) Programme to your patients teaches them DBT skills necessary to regulate emotions, control self-destructive behaviours and improve interpersonal relations. It was developed for patients with severe personality disorders, including borderline personality disorders. With an ever-expanding evidence base, the scope of DBT has been widened to reach individuals for whom BPD might be a co-morbid problem such as with eating disorders or substance misuse and has been adapted to function in a variety of settings, working with children and adolescents, people with intellectual disabilities or in prisons for example. Clients receiving CBT found the unrelenting focus on change inherent to CBT invalidating. Clients responded by withdrawing from treatment, by becoming angry, or by vacillating between the two. This resulted in a high drop out rate. And, obviously, if clients do not attend treatment, they cannot benefit from treatment. The sheer volume and severity of problems presented by clients made it impossible to use the standard CBT format. Individual therapists simply did not have time to both address the problems presented by clients – suicide attempts, urges to self-harm, urges to quit treatment, noncompliance with homework assignments, untreated depression, anxiety disorders, etc, — AND have session time devoted to helping the client learn and apply more adaptive skills. Adding Validation and Dialectics to CBT. In response to these key problems with standard CBT, Linehan and her research team made significant modifications to standard CBT. They added in new types of strategies and reformulated the structure of the treatment (see below, next section). In the case of new strategies, Acceptance-based interventions, frequently referred to as validation strategies, were added. Adding these communicated to the clients that they were both acceptable as they were and that their behaviors, including those that were self-harming, made real sense in some way. Further, therapists learned to highlight for clients when their thoughts, feelings, and behaviors were “perfectly normal”, helping clients discover that they had sound judgment and that they were capable of learning how and when to trust themselves. The new emphasis on acceptance did not occur to the exclusion of the emphasis on change: Clients also must change if they want to build a life worth living. Thus, the focus on acceptance did not occur to the exclusion of change based strategies; rather, the two enhanced the use of one another. In the course of weaving in acceptance with change, Linehan noticed that a third set of strategies – Dialectics –came into play. Dialectical strategies gave the therapist a means to balance acceptance and change in each session and served to prevent both therapist and client from becoming stuck in the rigid thoughts, feelings, and behaviors that can occur when emotions run high, as they often do in the treatment of clients diagnosed with BPD. Dialectical strategies and a dialectical world view, with its emphasis on holism and synthesis, enable the therapist to blend acceptance and change in a manner that results in movement, speed, and flow in individual sessions and across the entire treatment. This counters the tendency, found in treatment with clients diagnosed with BPD, to become mired in arguments, polarizing positions, and extreme positions. Thus, these three sets of strategies and the theories on which they are based from are the three foundations of DBT. Restructuring the Treatment. As noted above, very significant changes were also made to the structure of treatment in order to solve the problems encountered in the application of standard CBT. Below we discuss how DBT treatment is organized by Functions and Modes and by Stages and Targets. The treatment we are describing is the treatment that is considered to be Standard and Comprehensive DBT. It is the form of DBT that has been subject to the most rigorous research in terms of randomized controlled trials (RCTs). The variations of DBT that differ from the structure described below is being researched but has not yet been subjected to as rigorous a test as standard DBT. Thus, the reader should keep in mind that this is how comprehensive DBT is defined and that variations from this structure are not considered comprehensive or standard. Functions and Modes. Briefly, Linehan (1993) hypothesizes that any comprehensive psychotherapy must meet five critical functions. The therapy must: a) enhance and maintain the client’s motivation to change; b) enhance the client’s capabilities; c) ensure that the client’s new capabilities are generalized to all relevant environments; d) enhance the therapist’s motivation to treat clients while also enhancing the therapist’s capabilities; and, e) structure the environment so that treatment can take place. Due to space considerations, we will not review every possible mode (method) that can meet these functions. Rather, we offer the most common examples of how these functions are met in standard outpatient DBT. It is typically the individual therapist who maintains the client’s motivation for treatment, since the individual therapist is the most salient individual for the client. Skills are acquired, strengthened, and generalized through the combination of skills groups, phone coaching (clients are instructed to call therapists for coaching prior to engaging in self harm), in vivo coaching, and homework assignments. Therapists’ capabilities are enhanced and burnout prevented through weekly consultation team meetings. The consultation team helps the therapist stay balanced in his or her approach to the client, while supporting and cheerleading the therapist in applying effective interventions. (In DBT, a therapist is not considered to be meeting the requirements of the treatment unless he or she meets weekly in a DBT consultation team). Finally, the environment can be structured in a variety of ways, say by the client and therapist meeting with family members to ensure that the client is not being reinforced for maladaptive behaviors or punished for effective behaviors in the home. Stages and Targets. DBT also organizes treatment into stages and targets and, with very few exceptions, adheres strictly to the order in which problems are addressed. The organization of the treatment into stages and targets prevents DBT being a treatment that, week after week, addresses the crisis of the moment. Further, it has a logical progression that first addresses behaviors that could lead to the client’s death, then behaviors that could lead to premature termination, to behaviors that destroy the quality of life, to the need for alternative skills. In other words, the first goal is to insure the client stays alive, so that the second goal (staying in therapy), results in meeting the third goal (building a better quality of life), partly through the acquisition of new behaviors (skills). In short, we have just described the targets found in Stage I. To repeat, the first stage of treatment focuses, in order, on decreasing life threatening behaviors, behaviors that interfere with therapy, quality of life threatening behaviors and increasing skills that will replace ineffective coping behaviors. The goal of Stage I DBT is for the client to move from behavioral dyscontrol to behavioral control so that there is a normal life expectancy. In Stage II, DBT addresses the client’s inhibited emotional experiencing. It is thought that the client’s behavior is now under control but the client is suffering “in silence”. The goal of Stage II is to help the client move from a state of quiet desperation to one of full emotional experiencing. This is the stage in which post-traumatic stress disorder (PTSD) would be treated. Stage III DBT focuses on problems in living, with the goal being that the client has a life of ordinary happiness and unhappiness. Linehan has posited a Stage IV specifically for those clients for whom a life of ordinary happiness and unhappiness fails to meet a further goal of spiritual fulfillment or a sense of connectedness of a greater whole. In this stage, the goal of treatment is for the client to move from a sense of incompleteness towards a life that involves an ongoing capacity for experiences of joy and freedom. Two randomized controlled trials (RCTs) of DBT, supported by grants from the National Institute of Mental Health and the National Institute of Drug Abuse, have indicated that DBT is more effective than Treatment-As-Usual (TAU) in treatment of BPD and treatment of BPD and co-morbid diagnosis of substance abuse (Linehan, Armstrong, Suarez,Allmon & Heard, 1991; Linehan, Schmidt, Dimeff, Craft, Kanter & Comtois, 1999). Clients receiving DBT, compared to TAU, were significantly less likely to drop out of therapy, were significantly less likely to engage in parasuicide, reported significantly fewer parasuicial behaviors and, when engaging in parasuicidal behaviors, had less medically severe behaviors. Further, clients receiving DBT were less likely to be hospitalized, had fewer days in hospital, and had higher scores on global and social adjustment. Likewise, in the RCT conducted on DBT for women with co-morbid substance abuse, in addition to similar findings to the original study regarding improvement in BPD criterion behaviors, DBT was more effective than TAU at reducing drug abuse. Follow up indicated that subjects who had received DBT also had greater gains in global and social adjustment. DBT has also been the subject of RCTs conducted independently of Linehan’s research clinic at the University of Washington. Koons, Robins, Tweed & Lynch (2001) randomly assigned 20 women veterans diagnosed with BPD to either DBT or TAU. Unlike Linehan’s, et al. (1991, 1993) original studies, subjects were not required to have a recent history of parasuicide. However, subjects enrolled in DBT showed statistically significant reductions in suicidal ideation, depression, hopelessness, and anger compared to subjects enrolled in TAU. Verheul, Van Den Bosch, Koeter, De Ridder, Stijnen & Van Den Brink (2003) conducted an RCT in the Netherlands, again comparing DBT to TAU. Their findings are consistent with the earlier studies: Subjects enrolled in DBT had greater treatment retention, reduced suicidality, reduced episodes of self harm and self-mutilation. DBT continues to be the subject of randomized controlled trials. At present, Linehan (personal communication, 2003) is completing a randomized controlled trial of DBT v. Treatment- By-Community-Expert (TBCE). Other studies are ongoing regarding the use of DBT with eating disorders, DBT with BPD and co-morbid substance abuse, as well as the utility of DBT in other than outpatient settings. Allmon, D., Armstrong, H. E., Heard, H. L., Linehan, M. M., &.Suarez, A. (1991). Cognitive-Behavioral Treatment of Chronically Parasuicidal Borderline Patients. Archives of General Psychiatry, 48, 1060-1064. Koons, C. R., Robins, C. J., Tweed, J. L., Lynch, T. R., Gonzalez, A. M., Morse, J. Q., Bishop, G. K., Butterfield, M. I., & Bastian, L. A. (2001). Efficacy of Dialectical Behavior Therapy in Women Veterans with Borderline Personality Disorder. Behavior Therapy, 32, 371-390. Verheul, R., Van Den Bosch, L. M. C., Koeter, M. W. J., De Ridder, M. A. J. , Stijnen, T., & Van Den Brink, W. (2003). Dialectical Behaviour Therapy for Women with Borderline Personality Disorder, 12-month, Randomised Clinical Trial in The Netherlands. British Journal of Psychiatry, 182, 135-140. DBT programmes provide multiple treatment modalities that address the key skills and motivational deficits presented by clients with a diagnosis of BPD. Thus, DBT Programmes provide skills training for clients, often in a group format; individual DBT psychotherapy, to help clients identify and solve problems in changing their behaviours; and treatment modalities to support generalisation of the new skills beyond the treatment environment, most commonly by telephone coaching. In addition, DBT Programmes enhance the skills of therapists on the team and maintain their motivation to treat effectively by providing a mandatory weekly consultation team meeting where therapists receive supervision and consultation on their clinical work. Therefore each member of the programme will need to have dedicated time of at least 1 1/2 days a week to the DBT Programme. This training is intended for teams that are invested in learning DBT to a high standard in order to better implement the treatment in their settings. As DBT is a treatment that requires an ongoing consultation team, the Intensive Training is designed for treatment teams, not individual practitioners intending to practice alone. A DBT team (minimum of 4, maximum of 10) is a group of mental health professionals who meet at least weekly to assist each other in applying DBT in their practice setting. Training is conducted in two five-day sessions of instruction divided by six to nine months of home study and requires a high level of dedication so we ask teams to discuss their level of commitment prior to applying. Intensive training consists of two, five-day residential training seminars separated by an interval of approximately six to eight months. 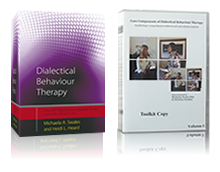 During the interval, teams undertake the development of DBT programs, the clinical application of DBT and other specified homework. Training is conducted with teams, as DBT recognises that therapists need a supportive system in order to sustain work with this client group. A team is defined as a group of clinicians who regularly meet and work together. Teams should be formed and meeting regularly prior to commencing training. Team members must commit to attending both parts of the intensive training and be in a position to undertake development work in the period between the training blocks. This requires each member of the team to commit a minimum of one to one-and-a-half days per week each to the joint development of skills and experience. Management support of this should be arranged prior to commencing training. It is not possible to accept individual applications for training, nor is it possible for teams to attend for a reduced time period. During Part One of the Intensive, teams will learn more about the practice of DBT, both individual therapy, skills group training, telephone consultations, and case management strategies via didactic presentations, role plays and other clinical exercises, together with viewing and discussing video-taped clinical material. Teams have the opportunity to think about the implementation of DBT within their own settings and to receive guidance on how to adapt DBT to unique aspects of their own services. Part Two of the Intensive requires teams to present their work, developed during the intervening months, for discussion with the trainers and other teams. Teams are required to present a protocol for delivering DBT within their own clinical setting and present a clinical case they have treated over the period of training. There is opportunity for further therapy skills development and the aim is to consolidate the teams’ work and enable it to proceed confidently. DBT is an integrative therapy based on behavioural and cognitive principles. Clinicians from a range of professional and therapeutic backgrounds have trained and are training in DBT, including former psychodynamic therapists. However it is essential for potential DBT therapists to have and/or be open to learning and applying basic behavioural principles. Each team should have at least one member with a background in psychology and one with a background in CBT. Attached is the team and individual requirements for attending the training.